The harvesting method is not a matter of taste but a matter of necessity. Each patient will have different characteristics and these should be taken into account when deciding on the best technique that should be employed. The most efficient form of harvesting is the strip method (“FUT”), the hair is removed in a single segment or strip. The area is closed using the latest plastic surgery techniques leaving a very narrow linear scar. 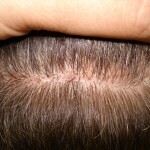 Using the latest technique, Tricophytic Closure, it is possible for hair to regrow back through the thin scar helping to camouflage it even further. The result is a barely noticeable scar with long or shorter hair. Normally the closure area is covered immediately post operation by the surrounding hair, although if the hair is shaved the closure will be visible until the hair grows longer. An advantage of this harvesting technique is the effectiveness and efficiency to remove a large number of FU´s in a single day as well as a high % of intact follicular units in optimum quality. Firstly, the donor strip has to be divided with the aid of powerful microscopes into smaller sections. The cuts are made precisely around the follicular unit to maintain their natural status; this process is known as ‘Slivering’. The resulting “slivers” are then further subdivided to obtain the naturally intact follicular units ready for transplanting. This process, performed under optimum magnification and illumination delivers world-class intact follicular units resulting in the best quality FU´s to attain the highest yield possible. This is a more recent donor hair extraction technique evolving from the dated punch grafting method, and is called “FUE” (Follicular Unit Extraction). The follicular units utilising a cylindrical punch (0.7-1.2 mm) are first punched and then extracted, with the diameter of the punch guided by the hair characteristics of the patient. For Follicular Unit Extraction to be performed at the highest level the donor hair must be shaved as this allows a better understanding of the natural follicular units’ orientation as well the variants of densities in the donor area. This is vital to follow so as not to leave areas of obviously lower hair density, visibly thinning or extracting hair from out of the safe zone. Once the FU´s are removed they are carefully examined under a microscopic to ensure that only healthy follicular units are transplanted. The overall graft numbers that can be extracted with FUE can be lower than that of FUT and it can also depend on the hair characteristics of the patient, harvesting outside the safe zone will increase the graft numbers available but this increases the risk that the transplanted hair in the future may suffer from hair loss. To prevent this and because the safe zone varies from patient to patient a conservative view must be taken as to the safe surface area to harvest from. An advantage of FUE is the avoidance of a linear scar making wearing shorter hair styles sometimes a possibility, but shaving the donor it may be possible to see the punch wounds, this is certainly the case two to three weeks post op. If many follicular units are removed there is a greater probability to leave visible cylindrical scars, as well as reducing the donor hair density to potential low levels. It is vital an intelligent harvesting pattern is adhered to and avoid potential complications for any future procedures, obvious scarring or a visibly thin donor, especially with short hair. The Follicular Unit Extraction is a very suitable method of donor hair extraction when the patient has a low demand for donor hair, smaller sessions. However if there is the need for higher graft numbers and with follicular unit extraction by calculation the donor cannot provide safely then FUT would be the much preferred method of harvesting. Read here , which Follicular Unit methods are available.